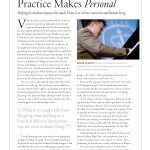 This is a story about jazz impresario, teacher extraordinaire and TC Doctoral student Victor Lin. It appeared in the Spring 2011 issue of TC Today. Victor Lin has recorded, performed his own compositions and drawn high praise from the jazz supernova Kenny Barron. Yet his musicianship has been equally galvanized by his students at the Stanford Jazz Workshop, the Mark O’Connor Fiddle Camp and Columbia’s Louis Armstrong Jazz Performance Program—including one who inspired Lin’s TC dissertation. “He asked me, ‘What do I practice?’” recalls Lin, an accomplished violinist, bassist and jazz pianist who is graduating this spring from the College’s Music and Music Education program. Without quite articulating it, Lin had pondered that issue his entire musical life. “I said, ‘Well, there are standard set of things everyone does, but just because I did things a certain way, doesn’t mean it’s most effective for you.’ And then I started to wonder, how did all the legends practice? What did they do?” And above all: how to make improvement a less “blind and self-propelled” process for his students than it had been for him?